The beautiful Chinese Province of Anhui lies in Eastern China. This inland province has the famous Yangtze river running through its heart, to the north of the river are the flat plains and to the South the Huang Shan Mountain Range which rise to over 5,900 feet. Green Tea has been grown in Anhui for hundreds of Years with Black Tea grown since the late 19th Century. 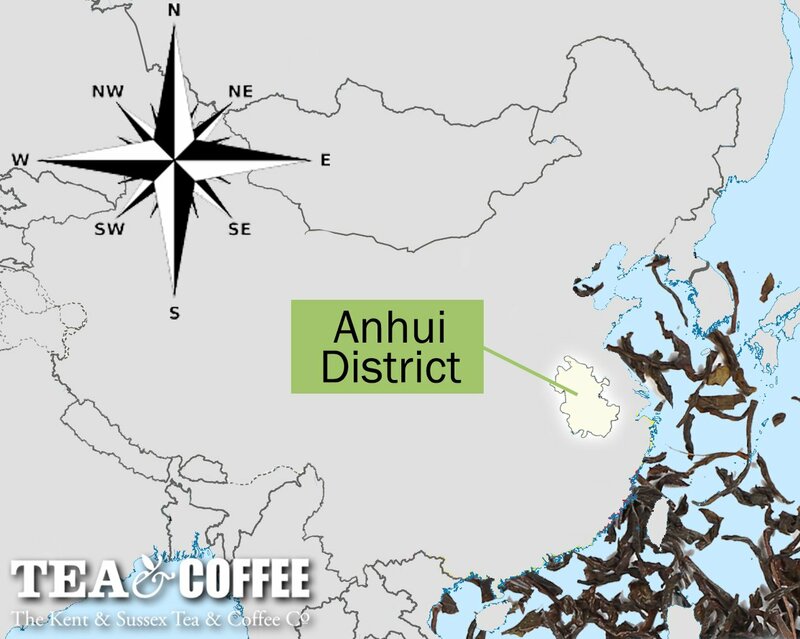 The main tea growing districts lie to the south of the Yangtze in and around the high Huang Shan Mountains. Some of the best tea growing areas around the world ( notably Darjeeling, India ) are from high mountain ranges. Growing conditions are very good with rich soils, a temperate climate and good rainfall levels. The mountains atmosphere is often called the “Sea of Clouds” as the clouds and mists roll in amongst the pine trees, the clear mountain air and the fresh mountain spring waters feeding the tea bushes. Famous Teas from the mountains include Tai Ping Hou Kui and Huang Shan Mao Feng Green Tea translated as “Yellow Mountain Fur Peak”. To the west is Qimen County which has a tea named after it, Keemun Tea. Keemuns are some of the most popular teas with the very best teas being picked in the spring, the first two leaves and a bud of the growing season going to produce some of the very best quality Teas, for example Keemun Hao Ya A and Keemun Hao Ya B. To the North of the Yangtze are some very fertile lower altitude tea growing districts. Here Green Teas and Yellow Teas are grown for including Huo Shan Huang Ya Yellow Tea, Lu An Gua Pian Green Tea and this is where our Kent Tea Company House Green Sencha Loose Leaf Tea originates.